Members of the Gallia County School Board seated with teachers who are a part of the Diamonds in the Rough project. From left, front row: Melvin Carter, Terry Halley, Beth James, and Stephanie Mulford. From left, back row: Brea McClung, Aaron Walker, Stephanie Campbell, and Cindy Graham. 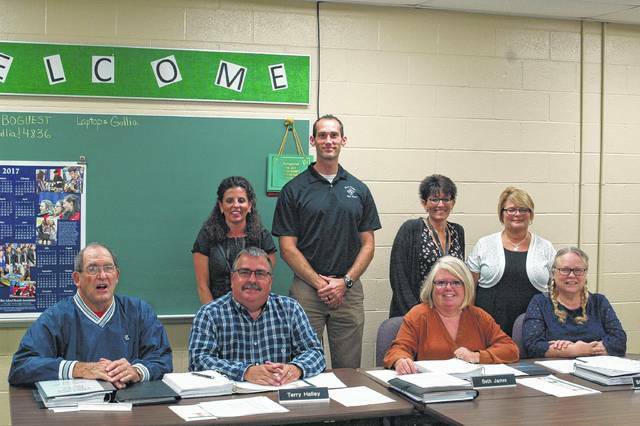 GALLIA COUNTY — Local teachers and administrators will travel to Chicago to present on their work on educating through the Advanced Placement (AP) Standard at the AP Midwestern Forum. Their presentation is called Diamonds in the Rough. According to Cindy Graham, a central figure to the story, this standard of increased rigor at River Valley High School is the result of finding what is valuable in rough Appalachian culture. This started with a trip to the Midwestern Forum two years ago that sparked the desire to do more for the students. In the past, teachers have taken curriculum that was tailored to students with trouble learning traditionally, and struggled to scale it up to students that needed to be challenged. Now, teachers at RVHS are setting the bar with the AP Standard and bringing it to the level of students that learn in different ways. “This allows us to raise all students, academically,” said Graham. This development has brought about numerous benefits for students; including an Ohio Supreme Court Justice coming to RVHS to talk with students through the Mock Trial Program. Graham is a part of a research team in Southeast Ohio that travels annually through the Gallia-Vinton Educational Service Center (ESC) for professional development and continuing education. These trips provided necessary networking with other schools and colleges while improving teachers as educators. According to Graham, this laid the foundation for what was to come. Teachers who are better educated can themselves educate students more effectively. This importance on culture results from a need to know ones self, according to Graham. She explained that students had gone to college in other parts of the country and were viewed as lesser than where ever they were. By teaching students about their culture, they are able to better equip students for college. By raising the standard to AP, all students are better equipped for the future, both culturally and academically. The trend of increased rigor and student expectations, in accordance with their learning ability, has resulted in beneficial partnerships for RVHS. The Mock Trial Program has partnered with RVHS. AP has sent two consultants to River Valley to help develop their program and rigor, both of which will be a part of the presentation in Chicago. University of Rio Grande has partnered with RVHS in allowing their classes to be taught by River Valley teachers in River Valley classrooms. “Dr. Denise Shockley is a prime example of what we are trying to teach our students,” said Graham. “We want them to embrace the positive aspects of their Appalachian Heritage and yet feel confidant enough to learn about new ideas.” Shockley leads the professional development and research team through the ESC, which Graham credits for the inception of infusing rigor. Because of this program, RVHS teachers are capable to teach college level classes at River Valley. “That is what we are doing, digging down and finding the diamond in the rough,” said Graham. Graham will travel to Chicago in February with other teachers including Aaron Walker, Brea McClung, Stephanie Campbell, and RVHS Principal TR Edwards.